"Hey, reward is a two-way street," said Bernie Bellwether, White House Under-secretary for Explaining the Abrupt Dismissal of Presidential Appointees. "You get kudos when your smear tactics work out, you get flushed like a two-week old dead fish when they don't. Fair is fair, and we've got to clean house." Bush announced that Karl Rove, who had lately held the post of Deputy Chief of Staff to President Bush and was widely recognized as being the "evil nincompoop" behind the Republican political machine, was summarily dismissed by the president during a brief announcement in the White House Dudgeon Office. Bush left the room without taking questions from reporters. Karl Rove, who is infamous for fighting back tooth and nail when under pressure and said he is not worried about his fall from grace, was picked up almost immediately by Venezuelan president Hugo Chavez, who has previously said he admires Karl Rove's thick-skinned political opportunism and amoral ruthlessness, qualities he recognizes in himself. "Mr. Rove is almost more like me than I am," a chuckling President Chavez said during a Caracas press conference announcing Rove's new appointment. According to Karl Rove, the sentiment is mutual. "Hugo Chavez loves making insane, inflammatory remarks and remorselessly vilifying and smearing his enemies in order to further his political agenda and strengthen his own power base. I mean, stand up at the UN and call someone the devil? It's like I'm looking in a mirror. So you can see how easy it will be for us to get along," Mr. Rove said. Under President Hugo Chavez, Karl Rove will have the position of Flor del Turd, loosely translated as "special presidential hatchet-man". "Politics can be a dirty business," President Chavez said, "and if you need to play dirty, you need a man who likes to get dirty. That man is Karl Rove. Welcome to Caracas, filthy Karl. You will love it here like a pig in the slop." With some pundits observing that President Hugo Chavez' socialist leanings run diametrically opposite to the political agenda Karl Rove has advanced during his years with Bush and the GOP, Mr. Rove was quick to explain that "personal politics has nothing to do with it." 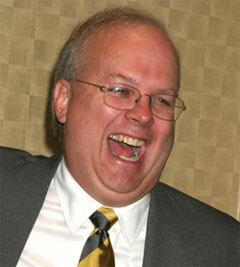 "Look, I have a particular kind of brain and a sociopathic dissociation with the consequences of my actions," Mr. Rove said. "Those kinds of gifts don't come cheap, and they don't come with a conscience. I go where I'm needed and where the money's good, and that's that." During his years as the chief strategist for the Republican party, Karl Rove was famous for his signature brand of political pranks and high-jinks. Some highlights include the times he dressed himself up as a bomb-toting terrorist and appeared at Democratic party rallies as a fervent supporter; the weeks he spent prior to the midterm elections making crank calls to potential Democratic voters in the middle of the night, disguising himself as the local Democratic candidate; and his placing of nuclear weapon assembly instructions on the Internet in an effort to bolster support for the Iraq war. "I'll miss those fun times," Mr. Rove said, "but I'm sure Hugo has a few ideas up his sleeve for some new mischief—real South-of-the-border style." Karl Rove, who said he plans to change his name to Karlos Rovorrido before the move, cited the "serious risk that political discourse may take a step up out of the gutter" in America as another reason for wanting to leave. "People start talking about the issues rather than mud-slinging," he said, "and I'd be irrelevant anyway. Plus, with the new Congress, they may start looking into that Valerie Plame thing, and Venezuela has no extradition treaty with the US, if you know what I mean."